Your heating and cooling appliances help keep your home comfortable throughout the year, but without regular inspection and maintenance, they can become a threat to your family’s safety. These tips can help you keep on top of necessary maintenance and the professional attention these appliances need to remain safe and efficient all year round. Clean and replace the air filter regularly. Clogged filters can result in toxic carbon monoxide fumes leaking into your home. 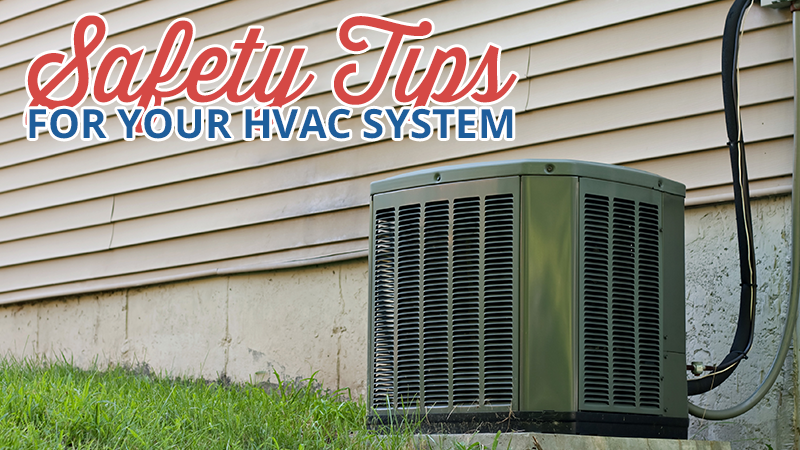 Replace furnace filters once every three months and AC filters once per month during the summer. Clear blockages and debris. Remove weeds and overgrowth within a 2-foot radius of your HVAC unit and have your technician check for blocked or faulty pressure release valves on your boiler. Prevent electrical fires. You can inspect all of your electrical cords for fraying or cuts and ensure none of them are buried beneath rugs or furniture. Plug window AC units directly into a wall, never an extension cord. And make sure your technician checks for loose connections — these can be dangerous and often occur with the natural heat expansion and contraction in heat pump units. Use a surge protector. In the event of a power surge, this device will shut down your heating and cooling unit to prevent damage to the system. Kids and pets need to be kept away from heating and cooling equipment to prevent burns and other accidents. Block off rooms with furnaces and boilers or set up barriers to protect your family. Make sure your home is equipped with both smoke and carbon monoxide detectors. The size and configuration of your home may require more than one of each unit spaced throughout for proper coverage. Test detectors. At least once a year, run a test on all detectors in your home to be sure they are still fully functional. Replace batteries. Test batteries in detectors monthly and replace them annually, even if they appear to still be working. Educate on safety. Make sure adults know where and how to turn off breakers and gas lines in an emergency. Teach children to avoid dangerous areas. While it’s always nice to save money maintaining your property yourself when possible, it’s best to leave appliance repair to professionals. The Consumer Product Safety Commission (CPSC) reports that 15 percent of all consumer product electrocutions occur while someone is trying to repair their own appliances. Schedule a tech visit bi-annually: Once in the fall and once in the autumn, a professional should come and inspect, maintain and repair your heating and cooling systems. Hire the best. Metro Comfort Systems offers its customers a combined 75 years of industry know-how backed by a sterling reputation for exceptional customer service and value.